Adam AAA balances combine precision weighing technology with modern processing software to provide the laboratory user with a reliable weighing instrument incorporating all of the features required for efficient analytical work. AAA are available in two different versions AAA-L with motorized internal calibration weight and AAA-LE with manual external calibration via the keypad. The AAA-L balance will also calibrate automatically when the temperature changes in excess of a preset amount. The GLP compliant software package enables print out of full calibration details, providing documentation to mark the audit trail. Weighing data can be transmitted to a computer or printer and the balance can be controlled using commands from a PC via a standard RS232C interface. 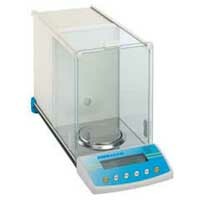 There are seven selectable weighing units in every AAA balance (mg, g, ct, GN, mo, oz, dwt). For working in an unstable environment digital filters and suppression of the last digit on the display optimize response time and speed up weighing operations. Features include parts counting and percentage weighing. A large, clear LCD display and sealed keypad with a positive feel .click. make it easy to operate the AAA. All balances feature full range tare and the TARE key is highlighted in yellow for quick recognition and use. Applications: For fast determination of mass, specific gravity of solids or liquids (when used with DDK). Functions: Digital filters, suppression of last digit, RS232 controls, density of liquid/solids software. Other features: Full range digital tare, below balance weighing, automatic recalibration when temperature changes, calibration report for GLP.